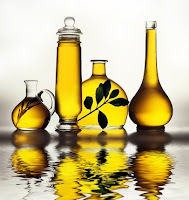 Previously, when doing my hot oil treatments, I would first wet my hair then apply the oil. I honestly don’t know why I did it this way but it’s the way I’ve always done a hot oil. When I started ‘educating’ myself on all things hair I encountered many discussions on this issue with everybody having a differing opinion. As you can imagine this was a little confusing so I just carried on doing my own thing. Recently, I’ve been trying to get a more scientific understanding of hair and haircare so I can really maximise the benefits of my regime. One of the things I came across is the first rule of chemistry which states that ‘like attracts like’. This really helped clear up all the confusion with my hot oil treatments and deep conditioning and I’ll explain why. Oil is a hydrophobe, which means it hates and repels water and is attracted to other hydrophobic substances. As dry hair is naturally oily due to sebum and product buildup, the oils you apply will be attracted to the oils already on your hair. This makes application and penetration easier. 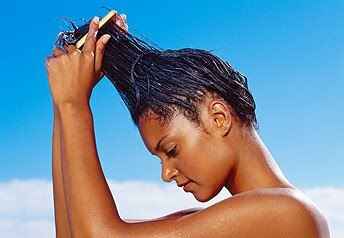 If however, you wet your hair before applying oil to it, the oil and water repel each other making it more difficult for the oils to penetrate and coat the hair shaft. On the flip side, conditioners are mostly made of water so applying it to wet hair helps it penetrate and coat the hair shaft better. Anything which is attracted to water is called a hydrophile (e.g. humectants). I know people who apply their deep conditioners to dry hair but this has never worked for me and now I know why. To summarise, it is scientifically more beneficial to apply your oils to dry hair and your conditioners to wet hair. However, you should do your own testing to see what works best for you. It’s about your hair and what it prefers. Previous StoryWhy Daily Moisturising is a MUST! !